The act, process, or art of imparting knowledge and skill to adults. What follows is an extremely condensed explanation of the Hood Andragogy. 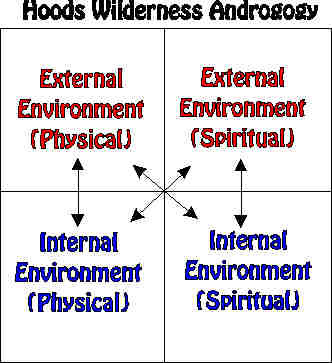 The Hoods Woods andragogy of wilderness teaching is based on four environmental influences active in every being. These four influences interact with one another to determine how successfully we will be able to face survival challenges in any environment. The goal of Hoods Woods training is to clear up all four panes of the window until we plainly see the internal and external influences acting on us. We then know what is needed for any survival situation and how to achieve a real survival capability. Each of these panes must be understood and respected with equal enthusiasm just as the tools to deal with each pane must be well understood. All understandings related to making a shelter, or knowing that a certain type of cloud formation is likely to bring rain, firestarting, trapping, edible plants recognition and usage, tool making etc.. This pane involves the hard skills of survival learning. Explains the internal physical issues of survival, caloric needs, shelter needs, repercussions of unmet needs, First Aid, etc. The Internal environment is the "self" needs of our bodies. Deals with concepts like hope, fear, and faith in a spirituality of ANY kind including our own personal spiritual beliefs. This pane also deals with our confidence, our PMA (Positive Mental Attitude), and with our feelings of adequacy. Our goal, our Art of Teaching, at Hoods Woods is to develop an understanding of the four panes of the window and then, through this understanding, help you to develop skills to deal with the needs presented by each pane.